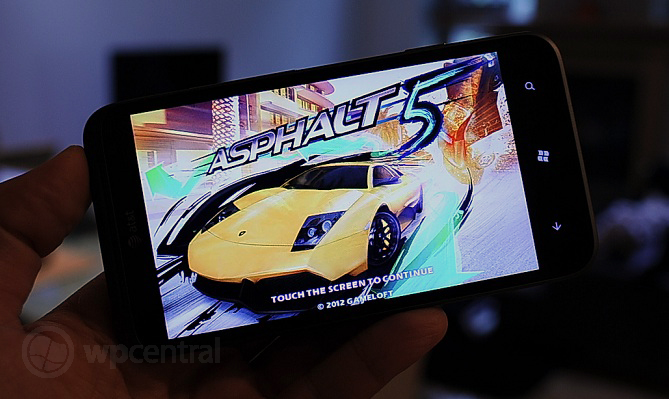 Fulfilling our tradition of badly punned headlines, this week’s Xbox LIVE title is Asphalt 5 from Gameloft. And it's ready for your challenge. The weird part? This game was one of the "original 50" Xbox LIVE titles for Windows Phone, meaning it's like just 2 years late. (Seriously, it was announced in August 2010). Racing games can be fun and Asphalt 5 should make many folks pleased with some punchy high resolution graphics of dreamy sports cars. Well, at least that’s how Gameloft is selling the game. In fact, it features over 30 cars including such beauts as the Audi R8, Ruf Rt 12, Ford Shelby GT500, Lamborghini Murciélago LP 670-4 SuperVeloce, Ferrari 599 GTB Fiorano. THERE’S A DREAM CAR FOR YOU - Take a ride in over 30 of the fastest, most prestigious cars you’ve ever dreamed, from manufacturers like Ferrari, Lamborghini, Audi and Ducati. THE WORLD IS YOUR RACETRACK - Highly polished HD graphics let you see every detail and animation of the track as you speed over snow, mud, dirt and more in 12 beautiful locations around the world including St. Tropez, Aspen and Las Vegas. Discover hidden shortcuts and jump off ramps! NEW WAYS TO PLAY - Challenge yourself to 8 different racing events including Drift Contest, Cop Chase, Time Attack, Duel Mode, Last Man Standing and Escape. Not too bad. Our initial thoughts? Load time is surprisingly pretty zippy, considering the graphics. Steering is handled by tilting the phone and it is sensitive. That translates into you hitting everything on the screen except the road for your first few races. Graphics are good although it does “skip” a little meaning the frame-rate is not as high as we’d want—but we’re probably dealing with platform limitations. For nostlagia, read our Asphalt 4 review for Windows Mobile back in early 2010.